Is it just me or do the holidays always seem like they’ll be better than they actually are? For the last ten days, Evan and I have been on the road, visiting family through Washington and Oregon. For me and my control freak ways, it has been difficult to give up nearly all control of the who/what/wheres of my life. I would like to say that I handled the season of family juggling with poise and grace, but that would be a lie. My grace broke down on Friday night (“Christmas eve” with my in-laws), when I stormed away from the dinner table after my repeated requests to talk about something other than how the rash of weather related deaths in the Pacific Northwest (climbers, the Kim family, carbon monoxide poisoning due to indoor generator use, etc…) lately would not have occured with more common sense were ignored. I personally can’t think long on this topic without feeling horrible and the combination of the conversation and tomato aspic salad proved to be my breaking point. Despite the chaos of family (or perhaps because of it), I have been knitting. I have completed the entire front of the mommy snug sweater (not shown) for a dear friend and pair of RPM socks that were knit using socks that rock garnet dreams to continue the sock a month challenge. 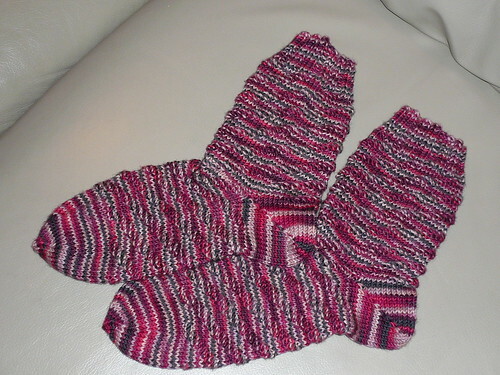 They were originally knit for my sockret pal, but they fit me perfectly, so their fate remains to be determined. Tomorrow, we head home to our own bed, our own cats (Evan and I have both been bitten by cats we’ve been visiting), our own kitchen, our own life. I’m looking forward to beginning year number two in the bay area.